This great spring festival, which exists in Eolyn’s world as Bel-Aethne, makes the perfect backdrop for the release of Daughter of Aithne, the third and final book in The Silver Web saga. Book One is FREE on Kindle this week only! It’s been a long journey, for Eolyn and her cohorts, and for me as an author. There were times when I thought I might never see this third book in print, and part of me still doesn’t quite believe it’s happening. But it is! Daughter of Aithne is now available in Kindle and paperback, just in time for summer reading. Another reason to dance the spring nights away! We’re celebrating on line with a number of events this week. First, those of you who haven’t started on The Silver Web will be pleased to learn that the first book in the series, Eolyn, is available free on Kindle through Friday, May 5. Visit Amazon to download your copy today. 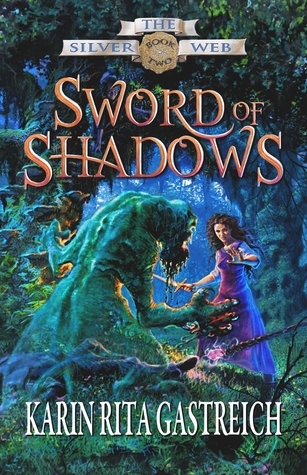 In addition, I’m running a Goodreads giveaway for the second book in the series, Sword of Shadows. Five paperback copies are up for grabs. The giveaway ends tonight, so if you’re feeling lucky, visit Goodreads or click the link at the end of this post to enter for your chance to win. Goodreads giveaway for Book Two ends tonight! Of course, Daughter of Aithne is the star of our show, so most of our attention will be focused on her. A tale of two women – Eolyn, Queen of Moisehén, and her political rival, Taesara of Roenfyn – Daughter of Aithne transcends the innocence of Eolyn and the dark violence of Sword of Shadows. The parallel journeys of these remarkable queens offer a unique opportunity to bring resolution to generations of conflict. As a war-torn history propels Eolyn and Taesara toward final, decisive confrontation, they hold in their hands the fate of four kingdoms – and the magic that sustains them all. Which woman will emerge triumphant? Will magic flourish or at last be erased from their lands? You’ll have to read the book to find out! Personally, this is my favorite novel of the three, and I am confident you will enjoy it, too. The virtual launch party starts today with a Goddess Fish Book Blast and will continue through May 19 with a Bewitching Book Tour. The book blast includes 37 stops! I won’t list all of them here, but you can visit Goddess Fish Promotions to see the complete list with links. Best of all, the tour includes another giveaway! Visit one of the tour stops, and you can enter for a chance to win a $10 Amazon/B&N gift certificate. The more stops you visit, the more chances you have to win. May 2 Spotlight: Jeni’s Bookshelf, Reviews, Swag, and More! May 4 Spotlight: Mello and June, It’s a Book Thang! That should be enough to keep you busy for now! I may be back later in the week with updates as reviews and other news comes in, and I will certainly post again one week from today with a new list of tour stops. But the best place to find me is out and about on the internet. I’d love to hear from you, so please come along with all your questions and comments about Daughter of Aithne and The Silver Web. Don’t forget: Eolyn is FREE on Kindle this week only! And the Goodreads giveaway for Sword of Shadows ends tonight.